LINES, VINES, AND JONAS TIMES: JONAS BROTHERS UPDATE ! There is going to be a new Jonas Fan Van after the Disney Channel heroes/classics/movies thingy! They're going to be talking about the world tour! Mark your calendars guys, because JONAS premieres Saturday May 2nd at 8pm, according to an ad in the new Seventeen Magazine. According to, http://www.ustream.tv/channel/hollywoodrecords, the Jonas Brothers, Demi Lovato, and Plain White T's are all on the list for the upcoming live webcasts! -Kevin is drinking Starbucks. I’ll try to find out what it is! -I know you guys want pics but I’m not allowed to take them here in the studio…I’ll try and get some from Radio Disney and post in the am. -Kevin says that if you round up 33 Kevins make up the length of the stage for their new tour! -OMJ I am right in front of the guys as they sit getting ready to talk to ernie! -The guys are getting set up at the microphones…eee!!! -Kevin just said “I’m keeping completely calm.” it’s so nuts here! -I’m close enough to touch them! -Kevin was like “We need like 400 more people in here!” it’s so crowded in the studio…I wish everyone could be in my seat. -Nick just said “Not to brag but I can throw a football at 73 mph!” LOL! -The guys are so sweet and keep waving and smiling to the fans outside the studio! 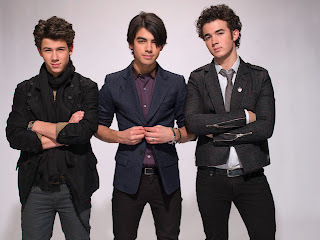 -Joe has on the BEST silvery sneakers on…kevin is wearing white sneakers and nick has off white casual dress shows on. -The guys just spotted me in the crowd and gave me smiles and little waves!!! Ahhhhh! -Nick is wearing black pants, a blue jacket and light grey tshirt! They look soooooo dreamy! -They’re here! So cute! Kevin us in jeans a green shirt and grey vest. Joe has on black pants blue shirt and khaki jacket. -The guys are in the building! They are going to perform 3 songs! So excited! -OMJ! I’m at Radio Disney getting ready for the Jonas Brothers to show up for an acoustic performance and answer fan questions!!! We know you have been waiting for the next FFE project, and we want to say thank you for being so patient! Next Wednesday, April 1st, we will be announcing another way for us to work closely together to make 2009 the best year ever. We can?t wait to tell you about our next FanFamily event….stay tuned! Corbin Bleu held an online press conference today, and Karleigh asked him who he would like to play the video game, Rock Band against, and he said Frankie Jonas. He said he thinks it would be great if Frankie whipped him at the game. Jesse McCartney just not that long ago in his live chat mentioned the Jonas Brothers. He mentioned how before they became like “The Beatles”, they use to open a few shows for Jesse McCartney a few years back. He said how he was so proud of them and how they were great writers and talented. Aww!